It’s hard to believe that Green Day has been around for two decades, yet here we are in 2014, still hearing about the latest shenanigans the band has been up to. But for now, let us travel to a time back before singer Billie Joe Armstrong threw temper tantrums on live television and the punk rock American Idiot tribute musical was yet to even be an idea. A magical time known as 1994 when Green Day had just released their third album “Dookie” and their single “Basket Case” had spent five weeks gracing the tops of the modern rock charts. 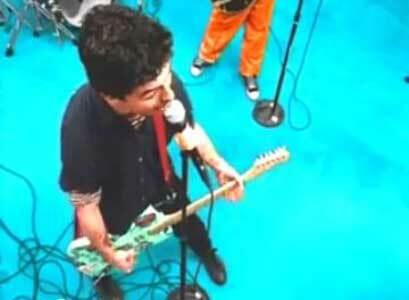 Green Day performing in the hospital. It was a typical Green Day song with the typical bitter lyrics and rhythmic tune, but when it comes to Green Day, typical is definitely not a bad thing. The accompanying video wasn’t much of a stretch for them either. It features the band as patients in what is supposed to be a psychiatric hospital performing the song. Doctors go about their business behind them, while trippy looking fellow patients donned in eerie masks shuffle around. A few scenes of the members doing things like taking medication or being locked away in their rooms are interspersed, but for the most part it’s merely shots of the band performing. There are some definite inconsistencies, specifically in costuming. 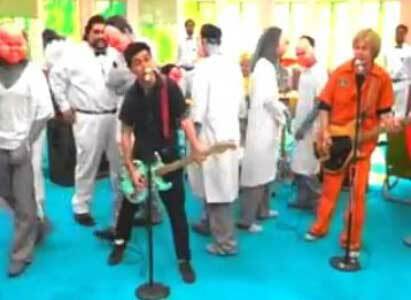 Bassist Mike Dirnt and drummer Tré Cool are both seen in “hospital attire” (which in Dirnt’s case, includes a pair of chucks), while singer Billie Joe Armstrong is just wearing black pedestrian clothes. There are also some color effects thrown in towards the end that are supposed to represent a “trippy” feeling, but instead just come off as cheap and last minute. Singer Billie Joe Armstrong next to bassist Mike Dirnt. All in all, “Basket Case” is on the verge of being creative, but falls short. There are certainly some interesting aspects, but there are just as many unoriginal ones, making this video average at best. Patients and doctors walking around as Green Day tries to perform. Buy some pairs of chucks for your summer fling.